LEDMyplace offers you the best lighting solution for your commercial space. 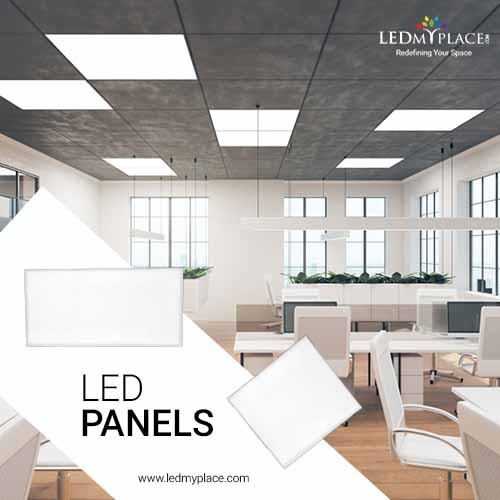 The LED Panels have an efficient lumen output and best quality light to show the true color of any objects. This lighting fixture is available in 2 types of 2x2 square-shaped and 2x4 rectangular shaped panel fixture. These LED Panels are the direct substitute of a fluorescent tube. Our lighting fixtures reduce energy consumption by 75% that leads you to save a lot of money on lighting bills. If you want to save more energy on a daily basis then you can use the dimmer feature which can reduce energy consumption. At LEDMyplace you can get 5-year warranty on this lighting fixture and, 30-day return policy and easy refund without any charge. This product is DLC certified and UL listed which makes it eco-friendly and user-friendly.